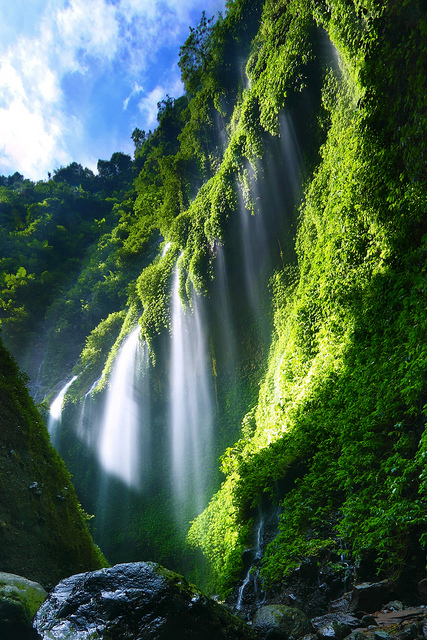 Madakaripura Waterfall, East Java lies hidden at the end of a deep valley in the foothills of the Tengger range. The water has cascades from the dense forest above. The primary attraction is its natural environment that is encircled by 7 falls and caves. The facilities, which are available, include; parking lot, food stalls, resting place and security post. The fatigue and exhaustion one undergoes from climbing the peak of Bromo, would immediately gone after getting a bathe with the holy Tirta Sewana so to continue the travel to other visiting points in Probolinggo area. Madakaripura Waterfall near Bromo mountain is possible reached from Surabaya Airport, Malang city and Banyuwangi Ketapang harbor, If you are interested to enjoy Madakaripura falls, you can take the public transportation from Surabaya Airport with duration for 3 hours driving to location, or you can use Our tour service with the tour package option. The atmosphere of Madakaripura Waterfall naturally radiates around the Madakaripura Waterfall and rumble sounds of Madakaripura water spreads louder after approaching the view centre. it is not only please the eyes but also freshen body and soul because of fresh and cool temperature come covering the visitors. Behind of the Madakaripura waterfall dropping, decorated with a cave on the wall which was believed to be the exact location where Commander in Chief Gajah Mada performed his last meditation and even dubbed as the tallest waterfall in Java Island until tobe the second tallest waterfall in Indonesia after Sigura-gura Waterfall near Lake Toba, North Sumatra. Madakaripura Waterfall, Probolinggo has related historic with a great Prime Ministry namely Gajah Mada, who strongly struggled to unify the whole territory of the nation under span of Majapahit supervision and said as “the last residence for Gajah Believed to be the final meditation place of military Commander Gajah Mada Chiefment,the great Javanese kingdom of Majapahit in East Java, the towering Madakaripura waterfall is fondly dubbed as eternal Madakaripura waterfall, since its waters never cease to pour down endlessly rain of blessings on those fortunate enough to walk underneath it. According to ancient Javanese legend that 14th century epic poem, Negarakretagama, Madakaripura was a piece of land given to Commander Gajah Mada by the Majapahit King Hayam Wuruk. Gajah Mada himself is the most celebrated military commander in the history of the great Javanese Majapahit Kingdom that thrived between 1293 to 1500AD. Its commander is recognized as the main figure who succeeded in unifying the entire Indonesian Archipelago then under the huge Majapahit empire (that at the time was said to stretch until Singapore, Malaysia, Brunei, Southern Thailand , the Philippines and East Timor) under his famous oath the “Sumpah Palapa”.It is said that the source of his overwhelming power and abilities lies within the cave of the Madakaripura Waterfall, where Gajah Mada frequently came to meditate. The great commander eventually chose the place as his last place for mediation before he was believed to have been –what ancient Javanese believed “Muksha” or vanished spiritually and physically from the face of the earth, rather than just dying physically. To honor this legacy, many people still visit the Falls to meditate or perform rituals, especially on the eve of 1 Suro, the Javanese New Year. The Native peoples of Madakaripura immortaliz falls as a historically significant place, culturally sacred and naturally spellbinding.